A new investigative look at the ties between big business interests in Colombia, former Secretary of State Hillary Clinton, and her family’s charitable foundation are raising troubling questions about the role that corporate trade deals and big oil may have played in softening the powerful Democrat’s position on human rights in the South American country. During her time heading the State Department, presumptive 2016 presidential nominee Clinton stayed silent on reports of violence and threats against labor activists in Colombia, even as her family’s “global philanthropic empire” was developing—and benefiting from—private business ties with a major oil corporation accused of worker-intimidation in the country, according to new reporting published Thursday by International Business Times. In addition, the IBT investigation shows that after millions of dollars were pledged by the oil company to the Clinton Foundation, Clinton reversed her position on a U.S.-Colombia trade pact she had previously opposed on the grounds that it was bad for labor rights. 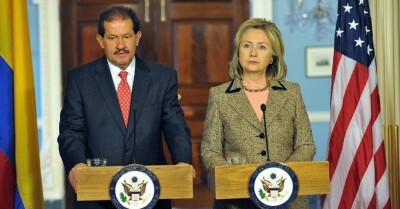 Just this week, justifying its opposition to the looming Trans-Pacific Partnership and Transatlantic Trade and Investment Partnership, the AFL-CIO pointed out that four years after the U.S. and Colombia signed the Labor Action Plan (LAP) to address entrenched labor rights violations—pushed by Clinton’s State Department in order to diffuse unions’ criticism of the Colombia trade agreement—Colombian workers have suffered over 1,933 threats and acts of violence against unionists. These include 105 alleged assassinations of union activists and 1,337 death threats. As the U.S. government negotiates broad trade agreements with Europe and the Pacific Rim, it must look back at the LAP’s continued failure in protecting workers’ rights in Colombia, and not commit the same mistakes. It must ensure that these agreements deliver on the promises made for over twenty years about the broader benefits of expanding trade. Investors and companies have received these benefits. Workers in the U.S. and countries that are our trading partners have not. We deserve it. Pointing to remarks she delivered in Hong Kong in 2011, IBT notes that Clinton has previously “championed” the TPP.